Today I went to Best Buy to pick up a new phone. I've had the HTC Apache (aka the PPC6700 or VX6700) for nearly three years now. I have kept the Apache up to date by putting WM6 on it, otherwise I probably would have switched sooner. I was going to get the HTC Touch Diamond, then I learned of the HTC Touch Pro (HTC 6850). This isn't an iPhone, but it's close enough for me. I just picked up the Samsung Instinct through my Sprint plan, but they are going to have the HTC Diamond available in a couple of weeks. What makes the HTC a great phone? I'm just trying to decide if I go to something like the HTC instead. @Chris: First of all, it's a windows mobile phone. That means I can install whatever I want on the phone. It also means I can write apps for the phone. Second, I have a keyboard. Third, I can use my phone as a modem. There are more reasons, such as the full VGA screen on this phone and the accelerometer (like the iPhone, turn the phone sideways), exchange integration, email integration on the whole, etc. Another great reason is that I am answering this post from my phone. 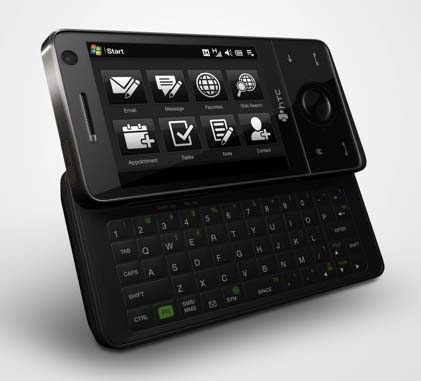 does anyone know how to use the htc touch pro as a modem without subscribing to a phone plan, just use as a modem??? @Frank: I think you'll have to ask someone else about that. From what I can tell, you have to have phone service or WiFi available for the phone to be used as a modem. But if you have WiFi available, you probably don't need the phone. I'm going to go out on a limb and say that you do need phone service. did you find out how to use the phone as modem? any file to download? Go to junefabrics.com, and download the software (PDAnet) for the HTC. It works, perfectly. Can I use teh htc pro as a modem on mu note book? I have the HTC pro with internet is there a way to use my phone as a modem without getting the data plan. what is needed to use this on a mac? has anyone discovered a good program for streaming music to your HTC from your computer. My buddies with the iphone stream there home libraries to there phones and i would love to do the same. My company is making us get rid of our phones and going to the HTC Touch Pro. Is this phone as bad as some of the reviews i've read on Verizon and CNET websites? @cocoathundr: It all depends on what your expectations are. I'm answering this post from my phone and I'll be emailing you from my phone as well in a minute. The speed of the phone as compared to other WM phones is pretty fast, if you compare it to WebOS or Symbian (or even iPhone's OS), you are going to find it slower. I personally am not a fan of the iPhone vs other because the iPhone is top notch and for nearly everything its gonna be on top. For freedom (customizability), features, and price of service the iPhone doesn't compare to WM phones like this one. Kyle -Missing Sync by Mark Space will connect and sync your Windows Mobile phone to your Mac. It works with Entourage as well as iCal, Address Book, iTunes and Mail. Great product! @Robz hey man, i really appreciate your post. I have had the HTC 6800 for a while. i loved all the extra buttons on the side; infra red switch, connectivity button, roller, notes button and ok button which they took off in the htc 6850. the htc 6850 is time and a half as fast though and really i dont think i need the extra buttons. So should i get a 6850 now? the insureance comp in soffering either the 6850 or the 6900 wich is all touch. Or should i consider just buying something else. sorry this was os long man. Thanks again. @VanBell: I still have the TP and it's been a good little phone up to this point. YMMV. That's good to hear. I'm thinking of getting a TP to replace my HTC Mogul that I have had for three years now. (extraídas de anteriores posts) para volver a Habilitar el uso de la conexión de datos de su teléfono y Recibe Alrededor de atar a las normas. Eliminar "ForceCellConnection", o (si estás nervioso) Acaba de cambiar el título. Hice la mía "OldForceCellConnection"
MaxCMConnectRetries Debe establecerse en "0"
Borró una al trabajar en esto antes. Si alguien encuentra una clave de allí, hágamelo saber y voy a actualizar con la información detallada. Este debería decir "Comprobar conexión USB Cable". Conecta tu USB a tu ordenador / teléfono. Esto Tomará un poco de tiempo (hasta un minuto de la primera vez) para que Windows reconozca el dispositivo como una conexión de Internet WinMo. Una vez que lo hace, el mensaje de estado en el sistema cambiara a "Esperando a la Red". Minas se sienta aquí Durante casi otro minuto completo. la clave que necesitábamos Nuke. Se desconectado volver y a conectar y lo encontró, va mucho más rápida es la segunda vez. Si necesita instrucciones más explícitas, hágamelo saber. El splashNews v0.91 trabajando en mi TP. Cambiar el valor de "teléfono como módem" un "Sprint"